This text focuses on developing an intimate acquaintance with the geometric meaning of curvature and thereby introduces and demonstrates all the main technical tools needed for a more advanced course on Riemannian manifolds. It covers proving the four most fundamental theorems relating curvature and topology: the Gauss-Bonnet Theorem, the Cartan-Hadamard Theorem, Bonnet's Theorem, and a special case of the Cartan-Ambrose-Hicks Theorem. Illustrations note XV, 226 p.
What Is Curvature?.- Review of Tensors, Manifolds, and Vector Bundles.- Definitions and Examples of Riemannian Metrics.- Connections.- Riemannian Geodesics.- Geodesics and Distance.- Curvature.- Riemannian Submanifolds.- The Gauss-Bonnet Theorem.- Jacobi Fields.- Curvature and Topology. "This book is very well writen, pleasant to read, with many good illustrations. It deals with the core of the subject, nothing more and nothing less. 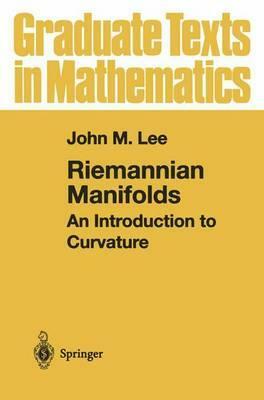 Simply a recommendation for anyone who wants to teach or learn about the Riemannian geometry."